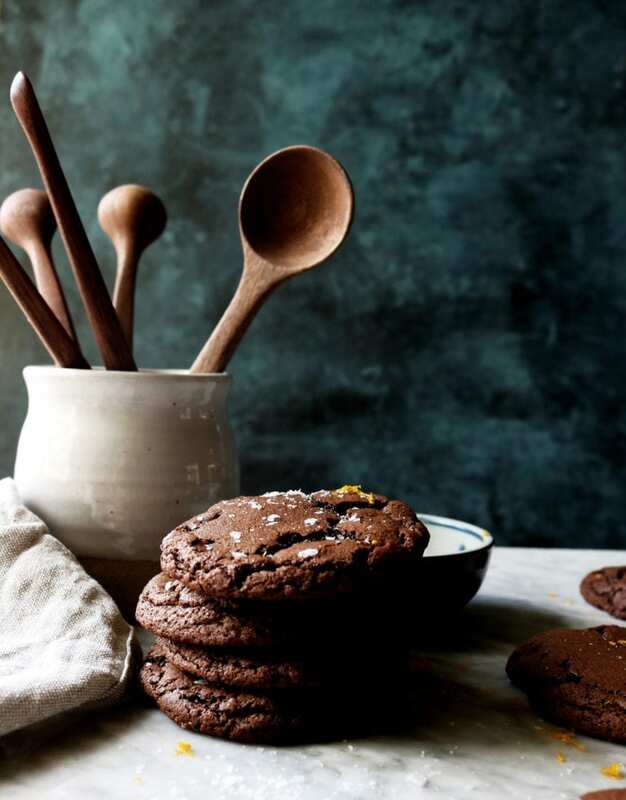 Picture a chocolate cookie with a slight crisp resistance when bitten and a rich, fudgy center. Then imagine it laced and scented with winter citrus. Yep. It’s that kind of cookie. 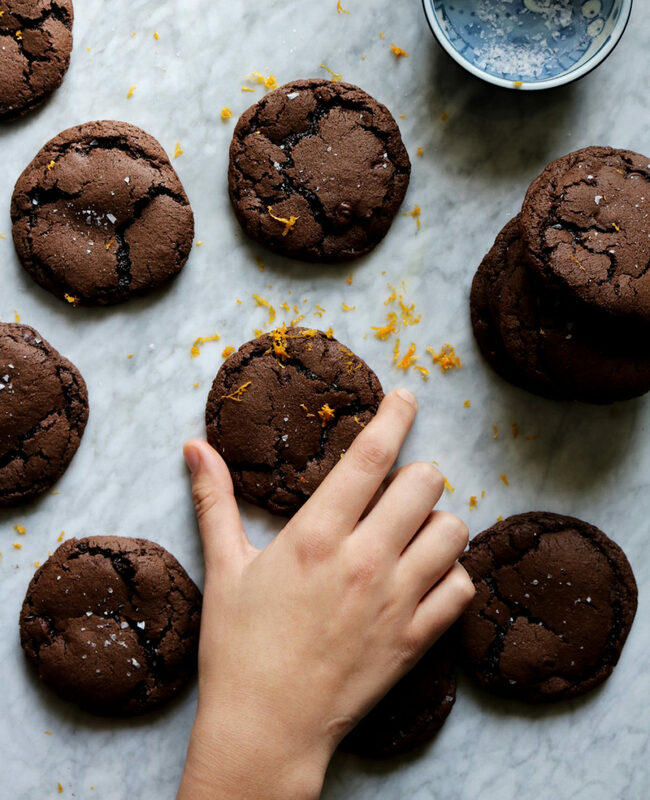 These chocolate orange truffle cookies come together quickly, take a short spell in the fridge and then are baked off in ten minutes. 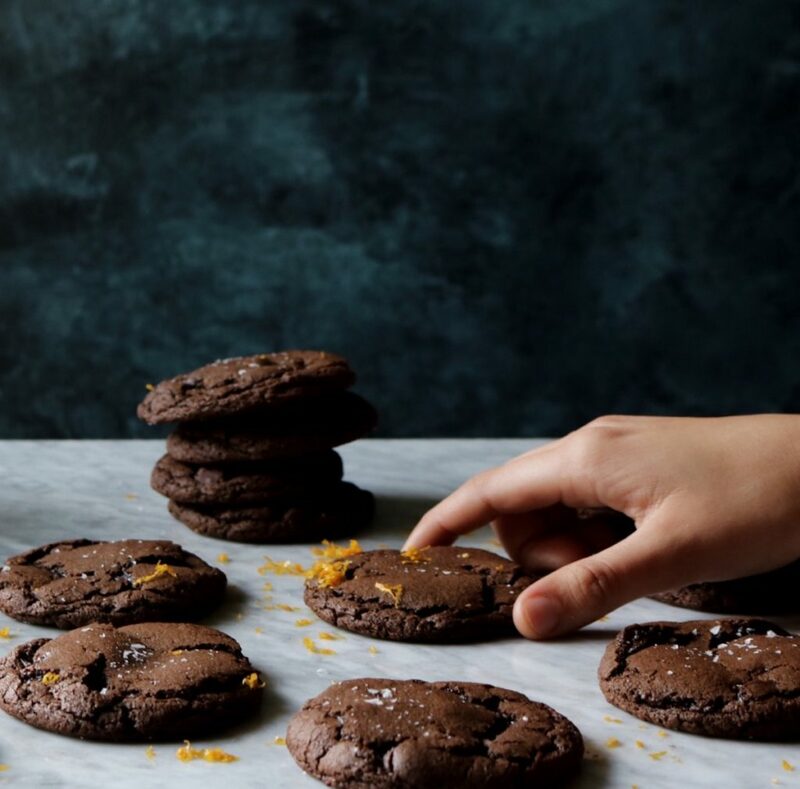 Not too long from start to finish, most of the ingredients are already stocked in your kitchen….chocolate cravings satisfied. How’s this new year finding you so far? Lots of exercise? Maybe more fruits and veggies? Perhaps it’s business as usual? However your new year finds you, I hope it’s filled with lots of love and good vibes. Melt the 8-ounces of chocolate + oil in the microwave (I usually do 1 minute on High, but microwaves are funky so keep an eye on things) in a large microwave-safe bowl or in a double boiler. Stir the chocolate to get rid of any chunks. Sometimes it will look chunky, but if you give it 20 or so stirs, you’ll get rid of all of the chunks without overheating (burning) your chocolate. While still warm, whisk in your brown + granulated sugars. Once completely blended, whisk in the eggs, vanilla extract and orange juice. In small bowl whisk together the bread flour, all-purpose flour, cocoa powder, sea salt, baking powder and baking soda. Gently roll 1 tablespoon of dough into a ball and place on the cookie sheet allowing about two inches between each dough ball. Cook for 10 minutes. You want to slightly undercook these. 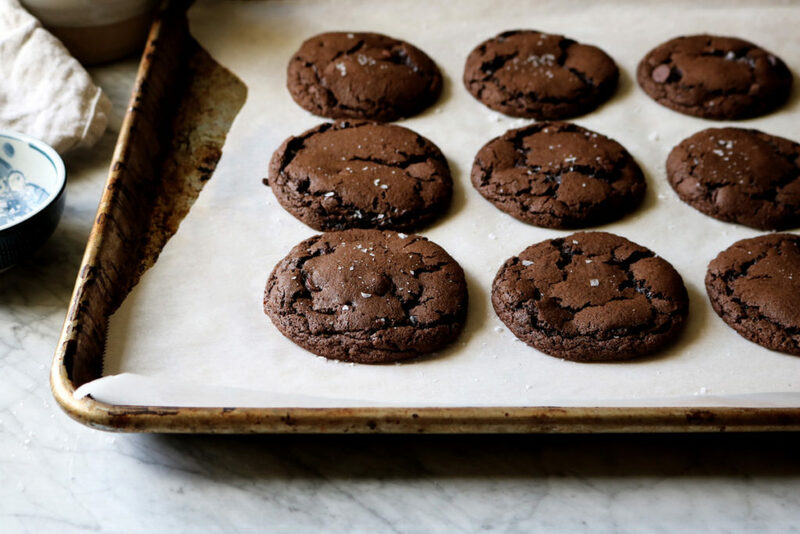 Dust with sea salt flakes, if using, as soon as they come out of the oven. Allow the cookies to cool on the sheet for 5-10 minutes then transfer to a cooling rack. Cookies will keep for several days stored in an air-tight container at room temperature. Thanks so much for making these cookies!! Tag me @displacedhousewife #displacedhousewife so I can see your cookies!! *Tightly wrapped dough can be refrigerated for up to three days before being rolled and baked off as usual. Hi Sharmila — Since it is only 1/2 of the flour in the recipe you can sub in the whole wheat. It will, however, change the texture of the cookie. When baking, if I want to use whole wheat, I usually grab white whole-wheat flour as I like how it performs when baked. I’ve been definitely getting my workout on. . .but that’s not new for 2017. After all, I bake a lot. . .and well. . .I don’t make enough money to afford a new wardrobe every month. . .so off to the gym I go. What’s new is yoga class because I’ve been finding that my body isn’t as. . .ahem. . .as youthful as it used to be so I seem to be injuring myself a lot easier. My hopes are that yoga will stretch the muscles and make them a little bit more resistant to the brutal work outs the Mr. likes to put me through. Now. . .off to the gym I go. . .so that I can stuff my face with these dark and mysterious chocolate beauties. These look like my new favorite cookie. Question: why bread flour? I see you use it in several other recipes too, and I’m curious about the reason. What happens if you use all-purpose instead? Thanks! I need about a dozen of these right now. I’ve been trying to be so good, so I deserve them! I love the orange zest and salt sprinkled on top. Lovely as usual! Karen — I’ve been trying to eat healthy too!!! It’s such a struggle… One cookie wouldn’t hurt?!?! Yuuuuuum! You are most definitely the cookie queen Rebecca! I’m swooning over these beauties! Oh do I wish I had one of those beauties right now Rebecca!! I love the chocolate orange combo!